Michael Ryan Lubricants & Co. Ltd. is a successful family run business based in Ballinascarthy, Clonakilty, Co. Cork. Established in 1988, Michael is delighted to be celebrating 30 years in partnership with Maxol Lubricants this October. 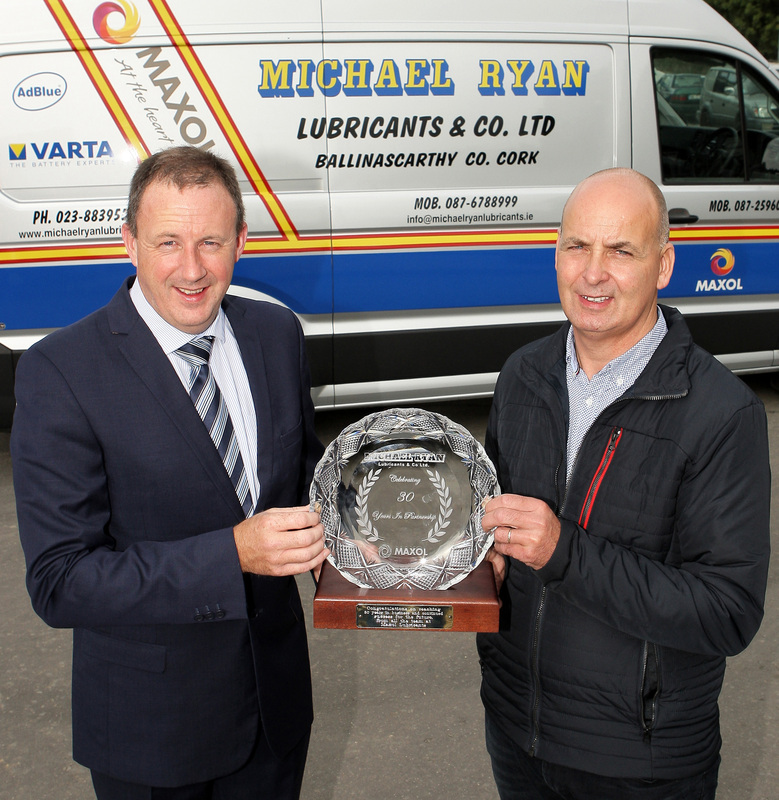 With a large customer base in the Munster region, Michael Ryan Lubricants operates in the agricultural, commercial, automotive, industrial and marine sectors. Speaking about his company’s success Michael says “It’s great to be celebrating 30 years in partnership with Maxol. It has only been possible due to my loyal customers and in particular the dedicated hard-working team – Tony O'Sullivan, Noel O'Regan, Alice Nyhan and my wife Gillian and family. The market has seen many ups and downs in the 30 years, but our business and customer base has grown and expanded year on year and I’m grateful our hard work has paid off”. Michael has been marketing and selling the complete Maxol range of lubricants for 30 years, Maxol Lubricants General Manager Owen O’Neill says “I would like to offer my congratulations to Michael and his team on reaching the milestone of 30 years in partnership with Maxol Lubricants. We are delighted to have Michael as an authorised distributor on our team. The business is thriving and that is down to the dedicated and hard-working team Michael has assembled. We look forward too many more successful years working together”. Maxol are a trusted brand leader and market a competitively prices range of premium quality oils, greases, anti-freezes and AdBlue to a wide cross section of industries throughout Ireland. Their technical expertise and reliability has ensured customer satisfaction and Michael speaks highly of the huge value of this excellent partnership. Today the company consists of Michael, Sales Representative Tony, Delivery Driver Noel and Alice in the office. "I would like to take this opportunity to thank my customers for their support over the years and to my dedicated staff who always go above and beyond to ensure that the customers needs are met", reflected Michael. To celebrate Michael’s 30 years in partnership, every customer who orders during October will receive a special 30th anniversary baseball hat and they will also enter a draw to win €1000 worth of prizes. Draw takes place at the end of October.